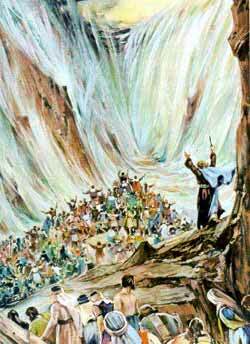 Moses leads the people safely through the divided waters. FTER THIS, BY God's command, Moses and Aaron went many times to Pharaoh to bid him let the people go. But Pharaoh would not, though God sent strange and terrible plagues upon him and his people to punish them for their wickedness, and make them obey Him. At length, as Pharaoh had commanded all the sons of the Hebrews to be slain, God in one night destroyed all the first-born in Egypt; and then, fearing for their own lives, the Egyptians hastily drove out the Israelites, men, women, children, and cattle, with their household goods, hurriedly gathered together. There were six hundred thousand men, besides women and children. God caused a pillar of cloud to go before them in the daytime, to show them the way they were to take, and at night He led them by a pillar of fire. After the children of Israel had left Egypt, Pharaoh, though his kingdom had been nearly destroyed for his disobedience to God, was angry with himself for having let them go. So he gathered together a great army, and pursued them to where they were encamped, in the wilderness by the Red Sea. When the people saw they were pursued, they were much afraid, and reproached Moses for bringing them there; for they thought it would have been better to be slaves in Egypt, than to be killed in the wilderness. But Moses bade them not fear; God would deliver them. Then the pillar of cloud and of fire, that had gone before to guide them, removed, and went behind the camp, so that it stood between the Egyptians and the children of Israel. To the Egyptians it was cloud and darkness, so that they could not continue their pursuit; but to the Israelites it gave light. Then Moses, as God had commanded him, stretched out his rod, or staff, over the sea; and the waters divided, standing like a wall on the right hand and on the left, leaving dry land between them, so that the whole multitude passed through the very middle of the sea to the opposite shore. The Egyptians, seeing this, hastened to follow; but God sent a violent storm upon them, which threw them all into confusion. When they were in the middle of the sea, where the Israelites had gone safely, God bade Moses again stretch out his hand over it; and when he did so, the waters came back again to their place, and drowned Pharaoh, and all the Egyptians: there was not one of them left alive. So God delivered the children of Israel, as He had said.